22nd May 2016: The Sankt Emmeramsmühle has no separate beer garden area where guests can consume their own snacks brought from home. The entire outdoor area is a Wirtsgarten. 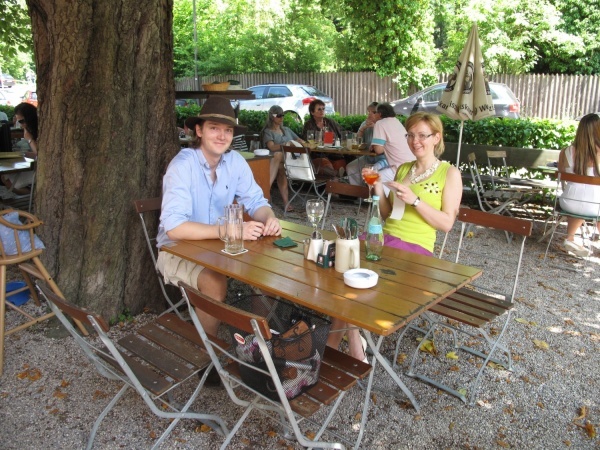 Sankt Emmeramsmühle (Saint Emmerams Mill) is a historical site, a restaurant and traditional beer garden by the Isar canal in the north part of the Englischer Garten in Munich. While the original building dates back to 1711, in 1825 an Emmeramsmühle beer was sold at this location which only farmers could order. The mill was rebuilt in 1866 and since 1929 the location is owned by the Spaten brewery, which today includes a beer garden with about 1,200 seats. Most part of the beer garden is waitress serviced only, while a smaller section behind the building is dedicated to guests who would like to bring their own food according to Bavarian beer garden tradition. Unlike other beer gardens, there is no self-service canteen, so the beer is also brought to these tables by a waitress. The beer from the tap is Spaten Hell (€ 7.20 p/maß, April 2013) (lager) and Dunkel (dark lager) as well as Franziskaner Weißbier and Franziskaner Dunkel Weißbier (light and dark Bavarian wheat beer varieties). The beer garden is open Monday to Saturday from 11am until 1am and on Sundays from 10am until 1am. St. Emmeramsmühle on Wikipedia In German language. North East Munich cultural website In German language. This page was last modified on 18 May 2018, at 18:55.